Working together business does better. How exceptional service, support and EDI solutions help SMB manufacturers and distributors meet rigorous compliance requirements to land bigger, better contracts. Since 2004 Exceptional Software Solutions, LLC has partnered with Data Masons, a leading provider of integrated EDI/XML solutions, to provide exceptional EDI services to its Exact ERP clients across the US and Canada. Realizing that their people could be much more valuable to their business, customers that have worked with Exceptional Software Solutions, LLC to take the Data Masons plunge have committed to better utilization of their business’ most precious resource — their people. We recently sat down with Glenn McPeak at Data Masons Software to learn more about their EDI solutions and how together with the Exceptional Software Solutions team, they provide Exact ERP customers with unapparelled service, solutions, and support. Q. Glenn, for those not familiar, can you tell us a little about Data Masons? 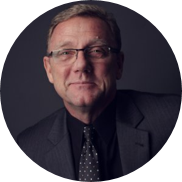 Data Masons provides an end-to-end EDI processing platform with seamless EDI-to-ERP integration, predictable costs, and comprehensive services — all of which give their clients a definite competitive edge. We leverage one of the largest trading partner compliance catalogs in the industry — that enables customers to set up new partners in hours rather than days or weeks. 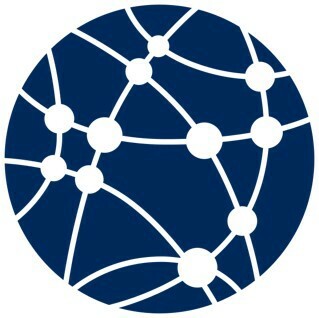 Learn how Data Masons is making EDI simple. Download the latest whitepaper. Q: Glenn, are there some key drivers behind why a customer would seek out Data Masons solutions? Absolutely. There are two primary reasons. The first is they need the ability to bring on new customers. If a new client of ours has a product they want to sell to a large retailer or distributor, they must comply with an extensive list of requirements in order to do that. They also must be compliant with that retailer’s practices. For example, let’s say they want to sell a product to the automotive industry. That industry has very specific requirements for labeling, electronic document compliance, and many more items. We help them with compliance for the one retailer. They can then turn around and use that process repeatedly as an EDI-compliant blueprint to approach other retailers. The second reason is that our clients are looking for efficiencies in the cost of doing business. Companies can certainly do EDI integration without using Data Masons, but this only works really for low volume operations. If you have a product that you want to sell to one of the giants like Wal-Mart or General Motors, where you might get thousands of orders per day, you really need the Data Masons solution. Otherwise, your only other option is to hire a literal army of data entry specialists. The Data Mason solution makes more sense because we move data in and out of the system without human involvement. Q: So, how did the Data Masons and Exceptional Software Solutions, LLC relationship begin? We started working together in 2004. At the time, Data Masons had taken on the role of being a go-to provider for specific customers. We partnered with the Exceptional Software Solutions, LLC team on accounts that needed to migrate from EDI solutions that were being phased out. Together we worked with clients who were using an EDI tool that lacked advanced functionality and the ability to meet their customers’ needs. Processes were very manual and pretty expensive to sustain. On top of that, the clients were in jeopardy of losing business because they couldn’t meet compliance requirements. 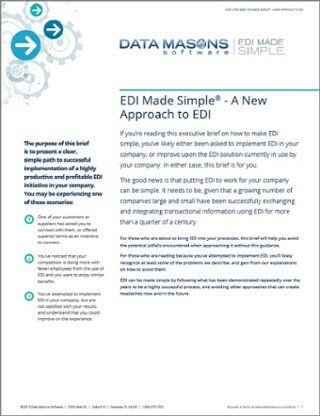 They had to change EDI solutions and migrate for better functionality and efficiency. Q: What’s the secret sauce” that holds the two teams together? The secret is the long personal relationship we’ve had between our two companies. I’ve known Tod for over 20 years, and other key people at Data Masons have worked with him for a very long time as well. We really do take care of each other and keep the customer in the forefront at all times. Q: Can you think of a particularly difficult project the two teams have partnered on? I remember one particularly interesting client that had an urgent need to solve an EDI processing challenge. It was putting their whole business at risk. They were not able to make the solution they had in place work — they’re backs were against the wall. The customer had made a previous decision not to use our Data Masons solution. However, with the help of Tod and the Exceptional Software Solutions LLC team, we were able to come in and work with that customer to convince them in a couple of days why we felt it was in their best interest to use our product — and they purchased it! We implemented it in a very rapid fashion. Normally the process from contract to go-live would have taken five months, but we did it in under 30 days. Believe me; it was all hands on deck. 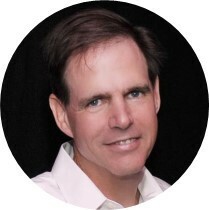 Tod Replogle, President, Exceptional Software Solutions, LLC. Q: Most firms are running Macola 10 and Exact Globe, but a select few still run Exact Progression and ES. Can Data Masons support Exact ES or Progression? It would be simpler if everyone upgraded to Macola 10, but we do offer support plans if they haven’t. It’s not a show stopper. We can handle it. Learn more about Data Masons EDI solutions. Q: In your opinion, what’s the most overlooked feature in the Data Masons suite? I think companies don’t realize that their purchase order and invoicing processes can be 100% automated. A typical scenario is what’s called a three-way match. It is very labor intensive. First, POs are sent out to suppliers via a variety of mechanisms — email, fax and other methods. The POs are received and keyed in, and there is no specific acknowledgment that the PO has been received. This is where things go wrong. Products don’t show up because the supplier never got the PO. On top of all that confusion, you have people doing data entry, which is by far the most labor-intensive part. It’s exacerbated especially on the inbound invoices, which come in different formats and sizes. They all look different resulting in staff manually doing a three-way match — match the PO to the invoice to the receiver. With our solution, transactions are integrated into the supplier system and vice versa. All transactions are acknowledged. Data Mason’s technology handles all of it electronically and completely eliminates the manual process. Q: It seems like Data Mason’s EDI solutions are a no brainer. Why haven’t more firms implemented it? It is a no brainer for some customers and a big leap for others. I think there are three reasons: lack of knowledge, fear or inability to see the cost-benefit. Lots of people don’t even entertain it as a solution because they assume that their small suppliers are not equipped to use this kind of technology. But we set up small suppliers with everything they need. They don’t even need a computer to be a Macola 10 user. The customer just really should step back and look at their data entry operations and the cost of manual processes and the errors that inevitably occur with manual entry. Q: How have the two teams partnered to help firms take the Data Masons plunge? Over the years, our relationship has definitely evolved into a much stronger partnership. Exceptional Software Solutions LLC has shown that they really do have their customers’ best interests at heart. Data Masons does as well, and our two companies are 100% committed to working together on that common goal for our shared customers. No matter how unique or intricate your company’s ERP processes or desired workflows are, Exceptional Software Solutions LLC’s team of professionals are here to guide you every step of the way. 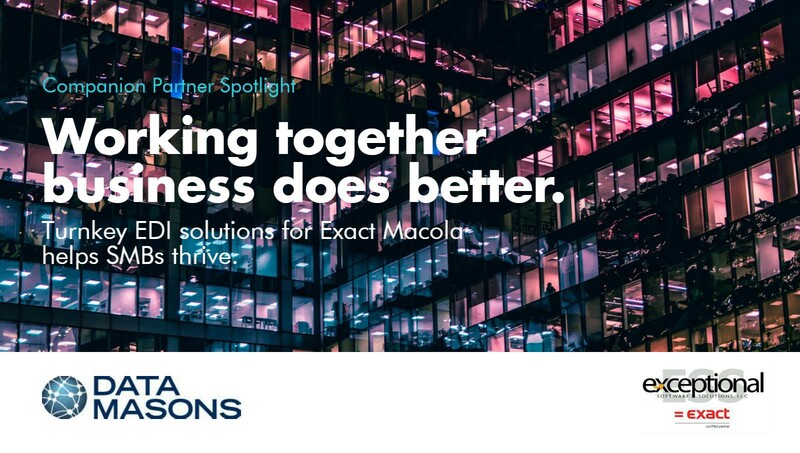 With some of the world’s leading Exact Macola and Synergy experts on our team, we love to create solutions for your ERP technology problems. Learn more about us from our customers. Copyright 2017 Exceptional Software Solutions, LLC.